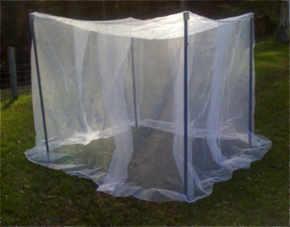 Fruit Saver Fruit Tree Net, is a fitted box-shaped net providing natural protection for fruit trees, against birds, bats, possums, and insects, including fruit fly and codling moth. Environmentally friendly, it avoids wasting money on harmful chemical sprays, bird scarers, ultrasonic devices or baits. Fruit Saver Fruit Tree Net, is ideal for organic fruit production. Fruit saver comes in 3 sizes. Standard Fruit Saver has a 2m sq roof and 2m skirt with 3 side pleats, providing a circumference of 11m. Large Fruit Saver has a 2.5m sq roof and 2.5m skirt with 3 side pleats providing a circumference of 13m. Both nets have an overlapped opening on one side, allowing easy installation and access to fruit throughout the picking season, without the need to remove the net. The Fruit Saver Fruit Tree Net, net can be placed directly over the tree canopy, gathered around the trunk and tied with twine. This method is most suitable for large trees. Alternatively, the net can be placed over a structure set up around the tree. 4 star-stakes with plastic tops are ideal. The net can be anchored to the ground. This method is most suitable for smaller trees. Poly-pipe can also be added to raise the roof height. Fruit Saver Fruit Tree Net, is suitable for most small-sized fruit trees including stone fruit, apples, figs, guavas, pears, persimmons. We recommend keeping trees pruned to a manageable size.